The jewel-box interior of the Davis Museum at Wellesley College gleams more brilliantly than ever after the reinstallation of the museum’s permanent collection last fall. More than a re-hanging, the project involved a re-envisioning of the entire collection. 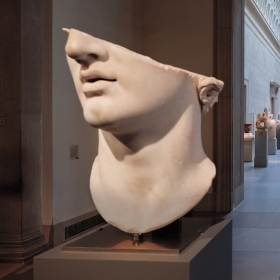 Thoughtful redesign of the galleries not only doubles the number of objects on display (from roughly 300 to 600), but also gives visitors a deeper understanding of the objects’ cultural and historical context. As a regular visitor to the Davis, I felt at home with the changes. While there are many new works to see, familiar paintings pop up like old friends encountered in unexpected places. For example, two of my favorites, double portraits of women—Wellesley Girls (1967) by Alice Neel and Loading (2011) by Tim Okamura—were relocated to the previously empty stair landings, which overlook the galleries above and below. From the galleries, you can see both paintings, setting up a dialogue between the two pairs of women. Also, as Lisa Fischman, Ruth Gordon Shapiro ’37 Director of the Davis, points out, these portraits provide a “female gaze” onto the collection. Similar touches can be found throughout the museum, including evidence of an understated sense of humor. In the fifth-level contemporary gallery, a small work by Jackson Pollock hangs next to a larger painting by Lee Krasner, his wife for a decade. Krasner, despite being a celebrated artist in her own right, could never quite escape being linked to the titan of Abstract Expressionism. “Only at Wellesley would the Pollock be this tiny painting and the Krasner be this huge, beautiful painting,” Fischman says with a laugh. The curators moved key pieces of the collection to where they can be seen and better appreciated. 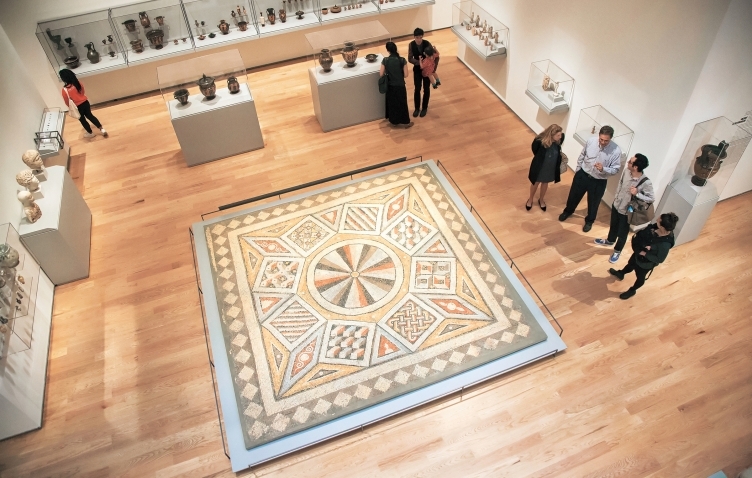 An exquisite 5th-century mosaic was relocated (carefully, because it weighs more than four tons) from the museum’s fifth level to the second level, where it serves as the centerpiece of the Greek and Roman collection. Instead of being displayed vertically on the wall, it’s now installed on a platform just above the gallery floor. You can walk the perimeter and appreciate the mosaic as its makers intended—as the floor of a Roman villa. While no changes were made to the building’s footprint, the reinstallation involved removing temporary gallery walls and replacing them with newer, thinner walls reconfigured to maximize hanging space. The galleries are mostly laid out chronologically and geographically, with generous maps and timelines. They feel denser, richer, and more substantive. Nowhere is this complexity more evident than in the early American and 19th-century American galleries. In the first gallery, you encounter Colonial-era portraits and silver (some made by female silversmiths) that express the wealth and tastes of European-Americans. In the next gallery, you’ll see mid-19th-century landscapes by painters of the Hudson River School that depict pristine, Eden-like wildernesses. It’s easy to see how these romanticized images exerted a pull on the popular imagination of the time. They embody the fulfillment of America’s “Manifest Destiny”—the belief in a preordained right to expand across the continent. Across from the Hudson River School landscapes are examples of Native American pottery, drawings, and beadwork. During the same period, tribes were creating practical and beautiful objects that expressed their identity, spirituality, and connection to the land. Here, contrasted within the same gallery, are radically different sets of values and means of expression. The galleries make this juxtaposition of cultures and objects striking and poignant. Another place where the reinstallation shines is three new galleries devoted to African art, previously a neglected realm of both scholarship and floor space at the Davis. After the curatorial staff had drafted a list of objects for possible display, in consultation with outside experts, the museum hired Amanda Gilvin, a specialist in African art, as assistant curator. 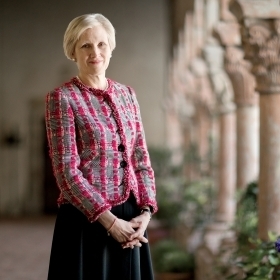 She took the lead in researching the 85 artworks on display. The collection includes masks and other ceremonial objects, as well as a sparkling collection of small bronze weights used for the West African gold trade. Gilvin examines African art through a cultural lens, using photographs and wall text to explain the uses of ceremonial objects, such as the D’mba, or shoulder mask, made in the first half of the 20th century by the Baga people of the Republic of Guinea. Gilvin’s scholarship reclaims the intent and use of these objects, which played an important role in village life. She also explores how these artworks were collected and brought to Wellesley. To prepare for the reinstallation, the curatorial team assessed the Davis’s holdings—which span four millennia and comprise more than 12,000 objects. 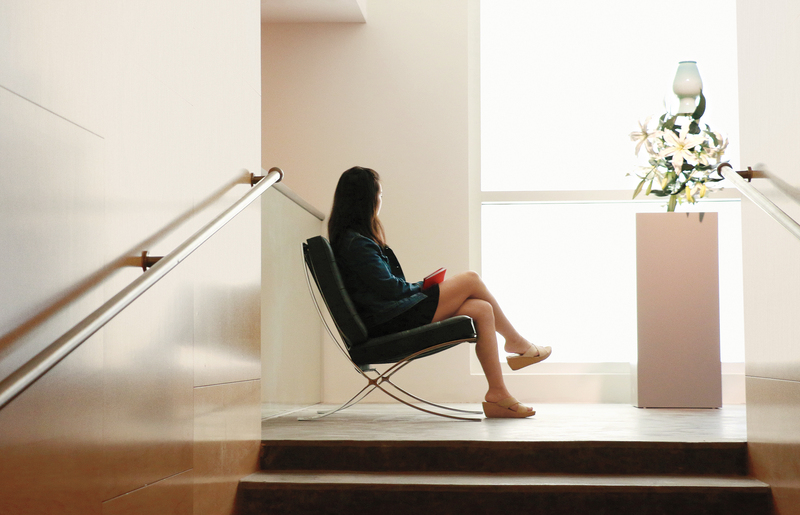 In early 2014, Claire Whitner, assistant director of curatorial affairs, and her predecessor, Eve Straussman-Pflanzer, began reviewing a list of 6,000–7,000 objects that could potentially go on permanent view. They evaluated the museum’s existing curatorial expertise and invited Wellesley faculty and outside scholars to review areas that were beyond their collective knowledge, Whitner says. As decisions were made about which objects to include, Whitner and Straussman-Pflanzer worked with Mark Beeman, manager of exhibitions and collections preparation, to determine the display-case requirements. Architects Rice + Lipka supervised the wall construction and worked with local fabricators on the display cases. During the summer of 2016, the team spent long hours overseeing the placement of art in the galleries. The reinstallation is the most ambitious museum project undertaken since the Davis building opened in 1993. 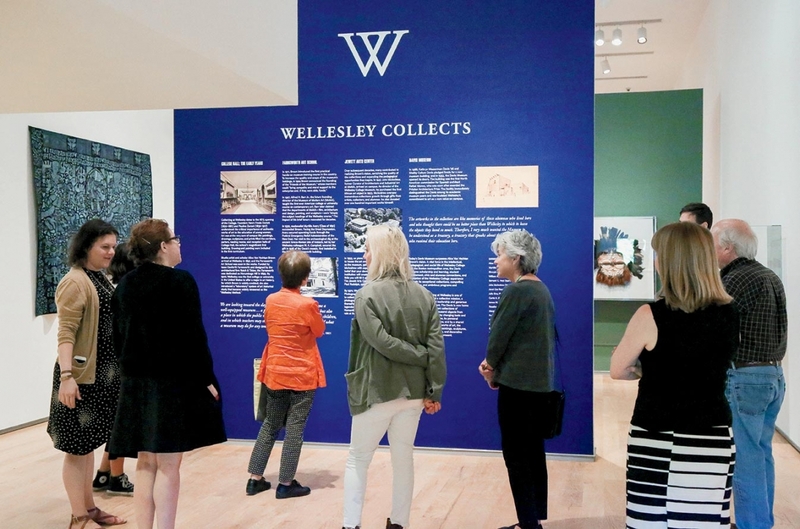 Wellesley’s museum is one of the oldest academic art museums in the country, and a goal of the reinstallation was to tell the story of the College’s educational leadership in the arts. 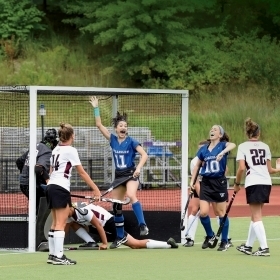 The “Wellesley Collects” wall on the second level explores that legacy. 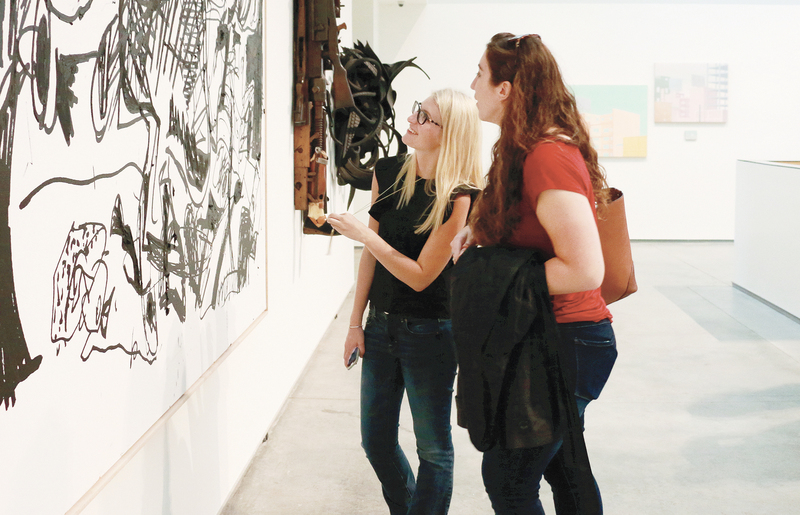 The College was the first in America to offer an art-history major. In the 1920s, Alfred H. Barr, Jr., taught the first course in modern art in the United States. (Barr went on to become the founding director of the Museum of Modern Art in New York.) 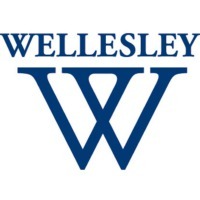 Wellesley was also the first undergraduate college to teach the history of photography. Director Fischman sees the Davis as a “resource and a portal” for the College community, and also as a link between the campus and the public. 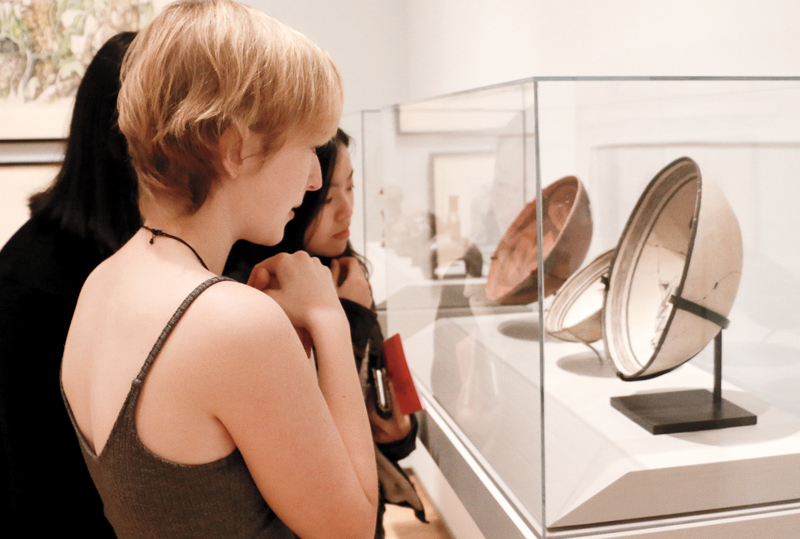 “The museum provides a way into the college experience, as well as into the excitement, intensity, and curiosity of mind that distinguishes Wellesley,” she says. The Davis’s reinstallation of its world-class collection is complemented by a separate project to renovate Pendleton West and create new studio-art space. 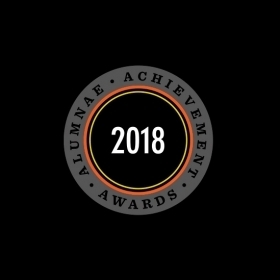 These developments testify to the importance of the arts on campus, a fact pointed out by President Paula Johnson during the Davis’s reopening gala in September. Visitors explore the southern Baroque and Spanish colonial gallery, taking in the 17th century Still Life With Side of Beef, attributed to Alonso de Escobar. Air-Lechinsky, a 2015 oil and silkscreen on canvas by Eddie Martinez, hangs in the late-modern and contemporary gallery. 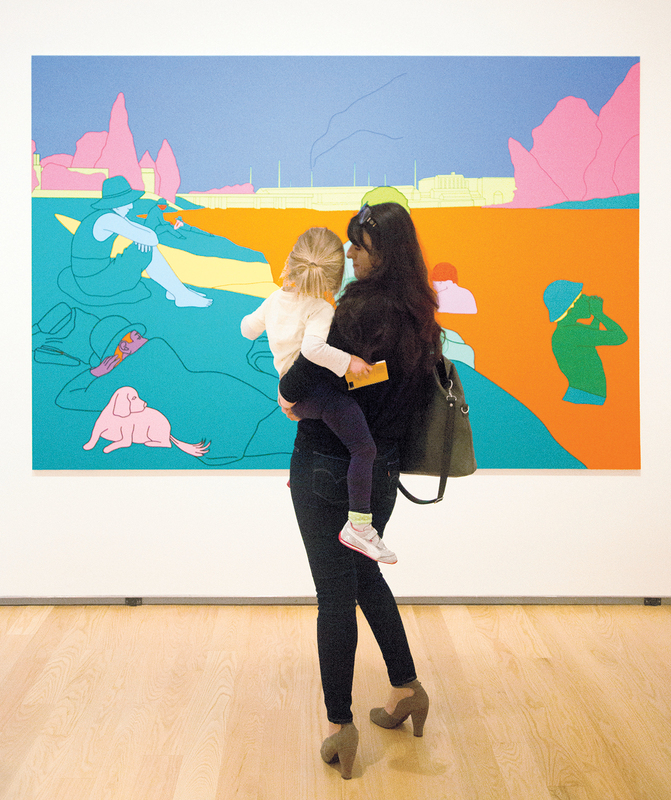 A mother and daughter ponder Michael Craig-Martin’s 2004 Reconstructing Seurat (Orange). I did not give the 17th-century drawing, General Guan Yu on Horseback, a second glance as I strolled the East Asian gallery. It took a smartphone app called Cuseum (Davis Museum) to slow me down so I could appreciate the general’s history. The app gives visitors access to more information than would fit on a typical wall label. Forget about QR codes you have to scan with your cell phone. Instead, when you stand at a “point of interest,” like the drawing of General Guan Yu, you’re connected seamlessly to additional content, such as photos, audio, and video. Through the app, I discovered a description of Guan Yu’s importance in Chinese history, written by Annie Wang ’17, a Davis intern. 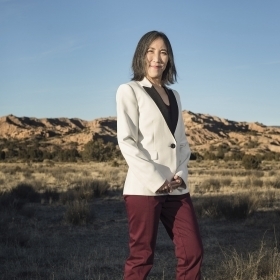 She explained that the general is a recurring hero in Chinese culture, and she included depictions of him in a Beijing opera production, as well as in the video game Dynasty Warriors. 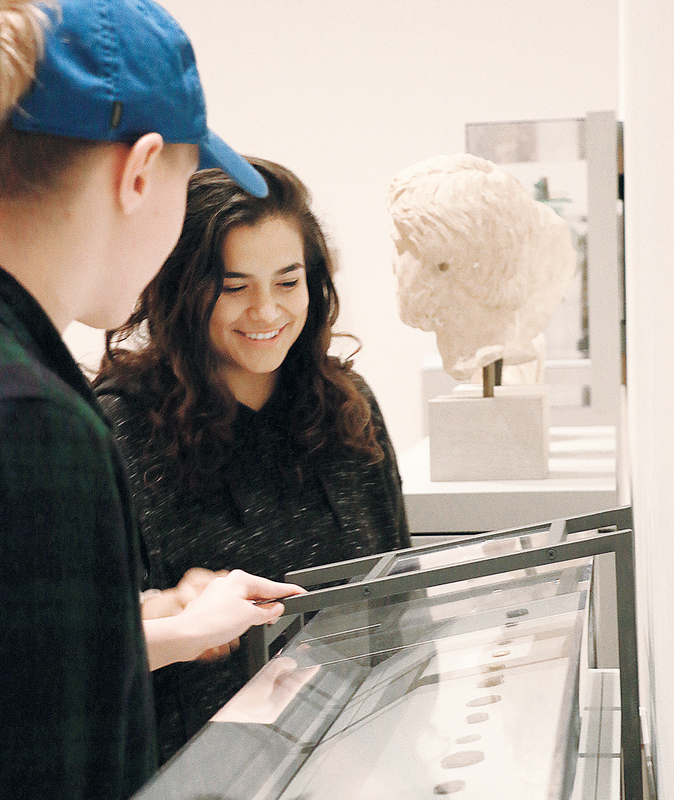 Wellesley students are an integral part of the content creation for Cuseum (Davis Museum), which currently features dozens of objects researched by 10 student interns. 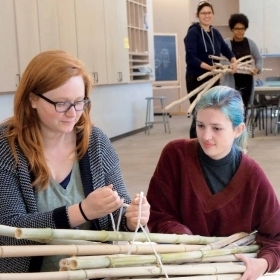 “Producing content allows students to take part in a large-scale digital project without waiting until they go off to a major museum,” adds Ciecko. April Austin, a former arts editor and writer for the Christian Science Monitor, is a writer for Lesley University in Cambridge, Mass.